DD5LP/P – September 30th. 2017 – DL/AM-176 Rentschen. Following the uncertainty whether the new Bazoka PRO loaded vertical antenna was working on 20m when tried at Attenberg, I needed another activation to test it and to see whether band conditions (which had now improved a little) had been the reason. The site had to allow me to erect the 20 metre dipole antenna alongside the Bazoka. Rentschen, being a large flat, grass fielded area (with little or no tree cover), not too far from my home QTH, made it a natural choice. As I had already activated it earlier in the year, so would not gain any points for the activation, but this was about testing equipment. At the same time, I wanted to try out the new digital mode (FT-8) from the summit and had prepared a windows tablet and interfaces for both audio and CAT commands to connect it to the FT-817. The hope was, that if indeed the Bazoka PRO worked fairly well on 20m as well as 40m, it would make a great antenna to use for my trip to Hochgrat the following week where space is limited and tourist traffic is high. So the full set of equipment would be used: the FT-817ND plus amplifier, the tripod and Bazoka PRO wideband vertical and the SOTABeams Band Hopper linked dipole with the 6m fishing pole. The screw-in base would also be taken along as there are no easy mast support structures at Rentschen. On the digital (FT-8) side my windows 10 tablet with Bluetooth keyboard and mouse and interface cables would be packed. Rentschen is a one point, low summit. It is about a 50 minutes drive from my home and therefore one of my “local” summits. The actual summit is marked by a trig-point stone which is about 100m away from the road, where I would park my car as usual. The summit is between Rottenbuch and Steingaden villages. The trip down I could do without any GPS Navigator or maps, I have driven the route many times and indeed after about 45 minutes, I was already parked and unpacking the car. 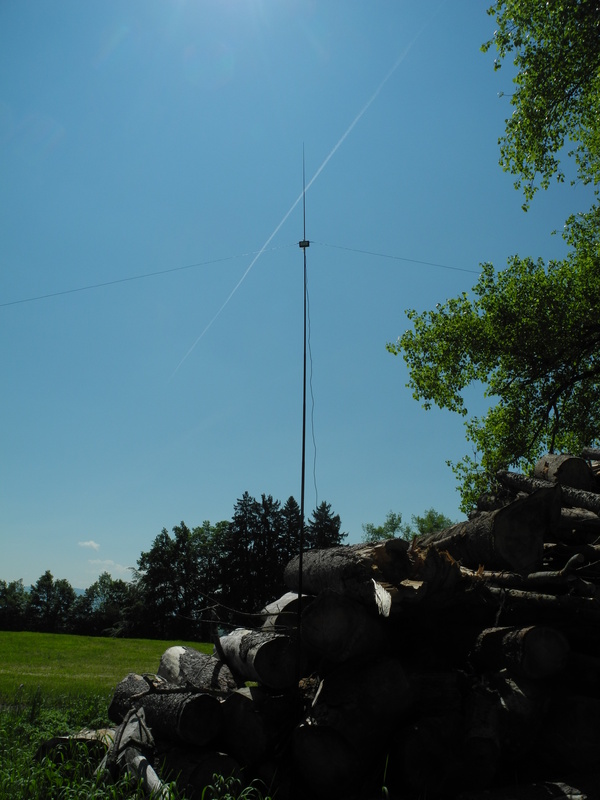 I first set up the tripod with the Bazoka antenna and then followed by putting up the linked dipole and eventually setting out the FT-817 and computer equipment. All completed without issues and by 11:15 local time (45 minutes before my alerted time), I was ready to go. First of all I tuned around 20m on the Bazoka PRO and the dipole and straight away the difference was very obvious. The FT-817 on the dipole was lively as usual and I could hear several loud stations. On the Bazoka the band was very quiet and while I could hear some of the same stations, they were at least 4 S-points down on the dipole. I then repeated these tests on 40 metres and the Bazoka PRO performed a lot better, the band was popping and the difference in signal strengths was only 1 or possibly 1.5 S-points. With the top of the vertical being about 2.5 metres off the ground and the centre of the dipole around 5 metres up, this difference is reasonable. So on receive at least, it seemed the Bazoka wasn’t going to perform well on 20 metres. I decided to go back to the 20 metres dipole and put out some calls on 20m to get some SOTA contacts in the log and if the stations were loud asked them to listen for me on the vertical. Although I could still hear a couple of the chasers on the vertical, none of them could her me. 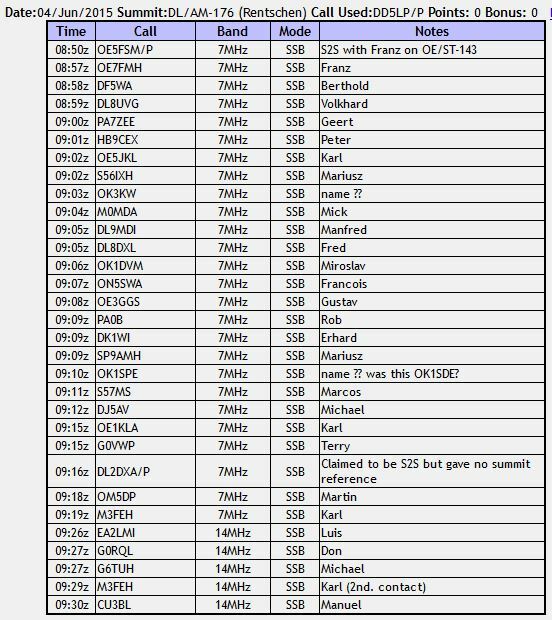 As regards FT-8 contacts – although I was receiving signals OK, after spotting on SOTAWatch I received no chaser calls, in fact no calls at all. Checking the PSK reporter, when I got home (log below), I was getting out fine with just the 5w running barefoot (no amplifier) from the FT-817, perhaps I needed to keep trying longer, however that was not to be as the farmer who owned the field came along to say he intended to mow the grass to make hay. He kindly offered me another field, still on the summit, but I decided I would pack up and leave as the time to disassemble, remove and reassemble probably wouldn’t warrant any addition contacts. I already had actions to do from my tests in any case. The vertical needs trying with an ATU and with a counterpoise, the tablet needs re-configuring to be more visible when in the open. Windows 10 tablet with BT mouse and keyboard and interface to the FT-817. The Bazoka PRO is not performing well on 20 metres. An ATU may help (despite the fact that the antenna analyser indicates a reasonable impedance across the band) or perhaps adding my counterpoise wires to the bottom of the antenna could also help it to operate better. Operating FT-8 from a summit, has the same difficulties as operating any digital mode from a summit operation of the computer (tablet in this case), is difficult in the sunlight and mouse operation was a pain however the Tablet to FT-817 Interface worked perfectly. Some kind of stand and shade would most likely help but then make the solution less portable and hence only possible on simple summits. DD5LP/P – March 11th. 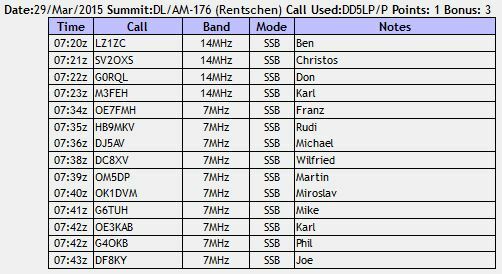 2017 – DL/AM-176 Rentschen (VK-EU S2S Event). I had planned to activate Bussen BM/BW-484 with it’s 8 activation points plus 3 winter bonus points up until the 15th. March, however as I was suffering a little from the flu, the thought of a 4 hour round-trip drive was not so inviting. With propagation being variable at best and horrible at worst, there was a chance that 17m may be needed rather than 20m. Rentschen has a major advantage that being a drive-up summit, it would be possible to go back to the car and fetch and replace the OCF antenna with the 17m J-Pole antenna if needed (at Bussen, this would have been a major operation). Also Martin DF3MC ccontacted me and said he’d like to come along. I always enjoy operating wth Martin, so the fact that Rentschen ia about the same distance from him as from me, made it a good choice. Equipment to be used would be the FT-817ND plus amplifier and the Aerial-51 OCF dipole with a 6m pole. The screw-in base, that had worked so well at Berndorfer Buchet, would also be taken along as there are no easy mast support structures at Rentschen. In the car would stay the 10m portbale mast along with the J-Pole antennas for 20, 17 & 15m. Rentschen is a one point, low summit that still has a 3 point winter bonus. It si about 50 minutes drive from my home and therefore one of my “local” summits. The actual summit is marked by a trig-point stone which is about 100m away from the road, where I would park my car as usual. The summit is between Rottenbuch and Steingaden villages. Considering the propagation conditions, I think things went quite well. 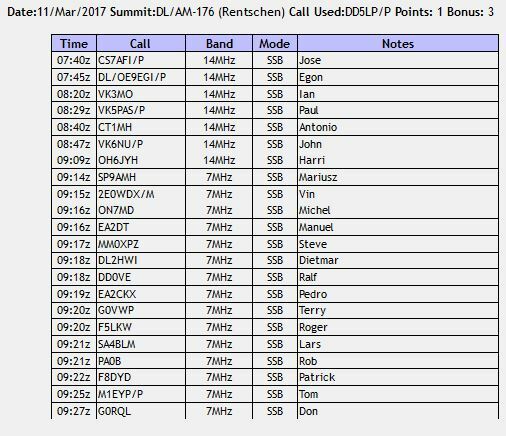 2 x VK S2S contacts (I think my first DL-VK6 – thanks John VK6NU). I heard my first Japanese summit but got no response when I called several times. I thought I would have to re-cone the speaker after VK3MO called me, he was so strong! I also heard Matt VK1MA call me but he couldn’t hear me I think. After about 0800 UTC, the usual QRO stations appeared on band and simply called CQ over the top of activators. 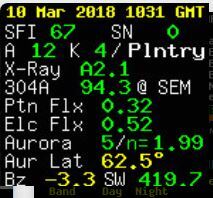 Conditions seemed to go up and down somewhat and at one point we had at least three summits on the same frequency! A surprise on 14.280 was Elvira XT2SE from Burkina Faso, West Africa, (non SOTA) who I tried calling but of course with the pile-up I didn’t get through. It was nice to operate with Martin DF3MC – he on CW and I on SSB, about 20m apart from each other – there was some interference but it didn’t stop us making contacts. I thought I’d “pick up a few contacts” on 40m before packing up. Thirteen contacts in seven minutes was the result and then even managed an S2S into the UK (thanks for your perseverence Tom M1EYP). All in all a good activation. Never base a decision on whether to activate on propagation predictions or even the conditions the previous day – Band conditions can improve (or get worse) without warning and the only way to know iff you are going to be able to make contacts is to activate and hope! DD5LP/P – April 21st. 2016 – DL/AM-176 Rentschen. As part of my attempt to get a station together that could operate on 80m from a SOTA summit. I had built a drastically shortened 80m dipole by including coils in its length. This was created at home based to a similar design that I have already installed at the home QTH only without a balun and of lighter materials but of course until I tested it out in the open on a summit, I did not know whether it really works or not. The problem with portable antennas for 80m is their size and very few summits have the space to put up a full sized 80m dipole, so a smaller antenna was needed. I had originally intended going to Ammerleite however Rentschen gives a lot more space and the distance from the car to the summit is a lot less, allowing me to pack more test equipment in the car in case I needed it. 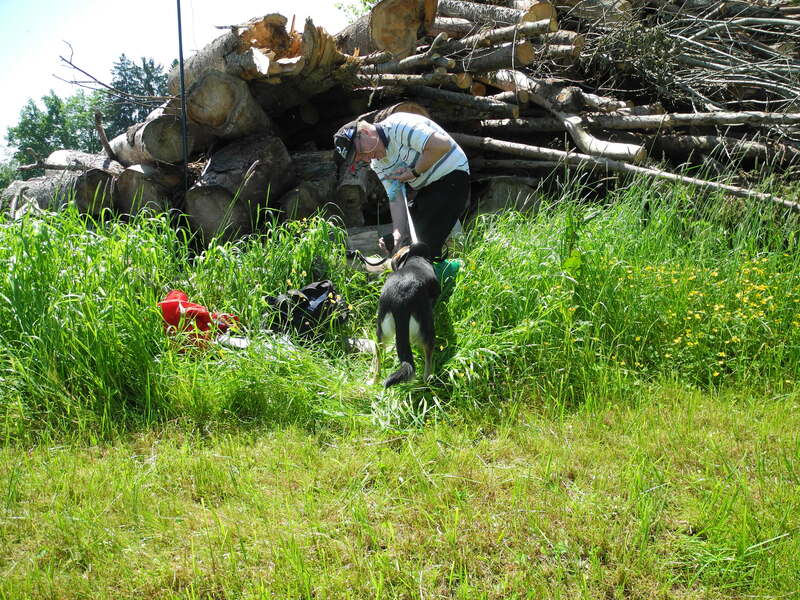 My wife also agreed to come along and as we then take our dog, Rentschen was a better choice. It also would earn me 1 activator point as the last time I activated it was in 2015 whereas Ammerleite would not. I had also expanded my Ramsey QAMP to operate between 80m and 15m using switched low pass filters in its output and while this had been tested on the bench, it had also not been tested in the field with the changes. As I did not expect many contacts on 80m, I decided running 30w from the amplifier rather thn just the 5w from the FT817 might be essential, so the QAMP would be taken long. Rentschen is about 45 minutes drive from my home. A drive I had done several times before and so no maps or navigation equipment was needed to get to site. Rentschen is a large grassed plateau sitting above the surrounding area. The actual summit is marked by a small trig-point stone, where there is also a small post, which while fimsey, can act as a mast support. 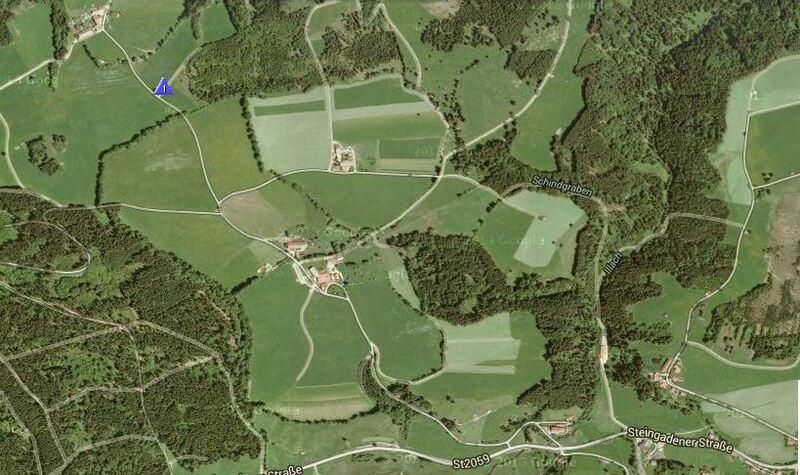 The summit location is only about a 100 metres from the road, where I parked the car. Once I had put the new antenna up, and laid out and connected the rig and amplifier, I took a tune around 80m and hearing nothing I went bck to my alerted operating frequency, 3670 KHz and started calling CQ SOTA while also sending a spot. I don’t know why but cell phone coverge from this summit was marginal and I had to place my phone in a particular position before it would send and receive SOTA spot data. This was actually 30 minutes ahead of my planned activation time, but after a couple of calls I heard a very faint signal, it was Herbert OE9HRV but why was he so weak? I thought I might have a cable break, so I disconnected the amplifier and connected the new antenna directly into the FT817 and then Herbert was full strength, so I tried calling him just with the 5w from the FT817 but it seems he had given up by this point. I got a report from Mike G6TUH that he had heard me at 5-3 but then I droped into the noise. I suppose this might have been first of all the 30w and then dropping to 5w but at that time of day a signal on 80m shouldn’t be able to get to the UK, about 500Km is the normal limit, which is mid France from where I was located. In any case, something was wrong with the amplifier. On receive the antenna connection should switch straight through, so the new low pass filters couldn’t be the problem, but a broken internal cable could be. In any case it was not something I could find and fix while out portable, so unfortunately the 80m antenna test was inconclusive and I’ll have to try again on another day. So down came the 80m antenna and up went the Aerial-51 OCF dipole and I ran off a few contacts on 40m to qualify the summit, so the afternoon was not a total waste of time. In fact it wasn’t anyway as it had been a nice sunny, warm, but not too warm, afternoon out. Although the test was inconclusive, the fact that a signal was received into the UK, looks hopeful. I fell fowl of the problem of changing two items at the same time. The QAMP must have a strange problem specific to the 80m wiring as it worked OK on 40m. Perhaps on my next test, I should simply try with just the FT-817 and if that works fine, then added the repaired amplifier into the circuit? This activation was planned to be of DL/AM-178 Ammerleite but when we approached, the single track road up to the summit was closed and full with tractors harvesting the field and this on a public holiday. Apparenly this road in now pemanently closed to motorised vehicles (so much for rights of way it seems). There may be an alternate access including little more walking but as I had my wife and our dog with me for this activation, I decided it was better to experiment on my own, some other time. So although I have already activated Rentschen, this year (I nearly got blown away from it back in March this year) I decided it would have no issues with access and the flat area on it’s top would be fine for the dog to go for a walk on. (Rentschen is very much an easy summit). The sumit is even signposted off the main ST2059 road! . 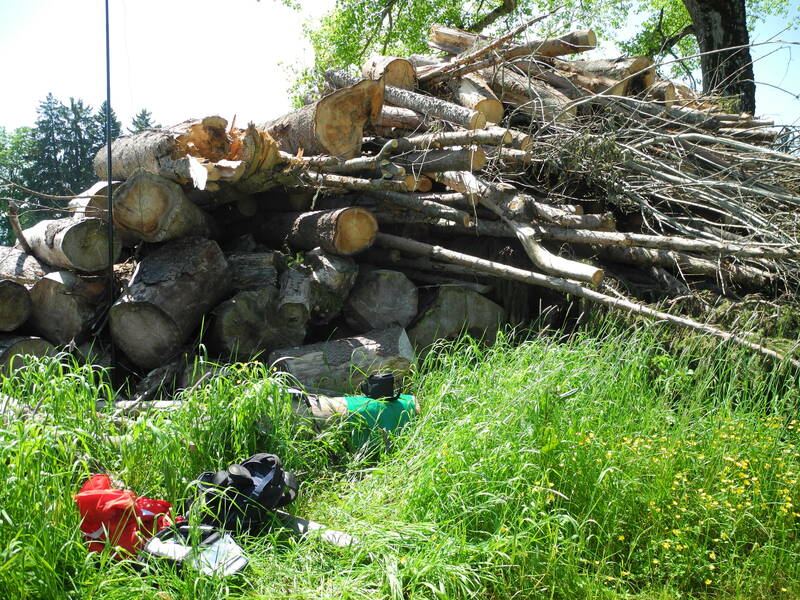 On arrival the pile of logs that were useful as support for the mast last time had grown considerably and again provided an easy mast support with the ends of the OCF (Aerial-51) antenna pinned out into the field. Despite the cancellation of the planned summit, I managed to get on 10 minutes before my alerted time on the replacement one. After about 40 minutes operations I had made 31 contacts. Mostly on 40m SSB but with a few on 20m. 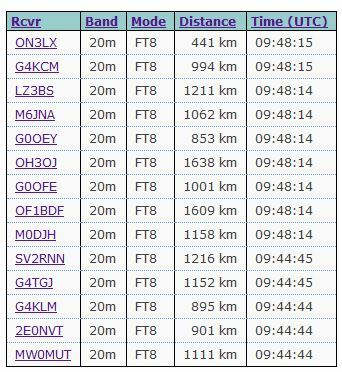 Interestingly UK stations that I would normally hear on 40m only managed the skip on 20m this time. There were a few other activators alerted and spotted as on when I was active but apart from one S2S contact, I could not hear the other activators. So this activation brought no activation points (as I had already activated this summit) and only the chaser points from one S2S but it was a nice day out with the wife and dog. The first SOTA activation for B 0 N N Y.
Don’t exepect sites to stay accessible, they can be closed off at any time – always have a reserve activation site. Originally planned to be three summits to catch the last possible weekend for 2015 SOTA winter bonus points (the period finishes om March 31st.). 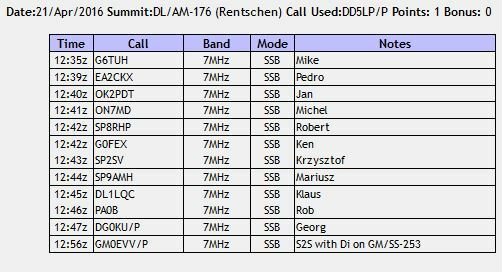 After the second being very difficult due to hurricane force winds, I cancelled the third summit which was to be DL/AM-178 Ammerleite. Preparation was only planning the activations to fit into my very tight weekend schedule, that I now have as I have a full time job again. Equipment used was the usual FT817, Ramsey QAMP amplifier, the Aerial-51 antenna and the 6m mast – all of which had had their batteries recharged and the tangles taken out of the antenna wire following the previous activation, so I was all set to go. Although the weather forecast was for some showers, the winds were the surprise. At my first summit DL/AM-176 Rentschen, although a little cold, it didn’t start windy but by the time I packed up the winds were extreme. The other problem for both of these activations, was that there was some contest on, on both 20 & 40m covering all of the band with S9+++ splatter. I had hoped to possibly get an S2S with Gerard VK2IO who was planning to be on Mt. Elliot (my old local summit) in NSW Australia. Whether we could have made a contact without all the QRM, I suspect not as the conditions were probably not good enough but by the contest stations destroying the band we will never know if we might have been able to make contact. Despite the winds at Rentschen, I decided to try for the next summit, Kernberg, anyway in the hope that the winds might die down, When I arrived it was not too windy however it didn’t take long for them to build up. Blowing my ruck sack off the bench at one point (and it is quite heavy). I struggled to even get the required 4 contacts at this summit. After the third contact the squid pole decided to drop down from 6 metres to about 3 metres but I didn’t think it worth fighting my way to the mast to put it up again, given that it probably would come straight back down again. Hence that Swedish contest station that was my forth contact had to realky work to hear me (despite that he still gave the contest standard 5-9 report!). Along with the winds and the contest QRM, I also had major problems with Rucksack Radio Tool, the application on my phone that I use to spot myself with and see which other activators are out. By calling and giving a contest station a point, I eventually managed the required 4 contacts. I may have done better if I had connected up the Ramsey amp on Kirnberg as I had on Rentschen but that would have been more equipment out to be blown away, never to be seen again! It’s hard to tell from the short film however it was really windy on Kirnberg, so much so that if I did not fasten or hold everything down, it would have blown away! Ramsey QAMP (only used on Rentschen). It is always best to air on the side of caution. There were times on Kirnberg when the winds were so strong that it was dangerous. Going on to Ammerleite would probably, at the least, ended up with some broken antenna equipment. The use of the Ramsey Amp does help getting through, especially when there are contests on. Never assume everything will work properly. After working perfectly for many activations, RRT kept aborting meaning I had to try up to 10 times before I could get a spot out as the program kept failing. I think this was due to lack on 3G signal, but the program shouldn’t abort for that reason. ,73 ’til the next Summit!